Sometimes adversity results in finding yourself balled up on the floor trying to keep your eyes from floating out of their sockets (so people tell me). Of course, then there are difficult situations that turn out to be opportunities in disguise. Now the latter I have experienced multiple times and that includes this week! I’ve mentioned recently that my days and nights are packed at the moment with work and training devouring the few chances I have to get my posts out. The month was churning away and my quota counter wasn’t moving nearly fast enough. Decided to forego some sleep last night and get back into the digital darkroom and work some images up. At least with the most time consuming part out of the way, I could find smaller chunks of time to get something out there for you. While combing through my image cache, a pleasant surprise greeted me. Turns out I had somehow overlooked a number of additional discoveries on our recent Texas trip over the Christmas holidays. One of those discoveries was this beautiful specimen. I think one of the brain fog contributing factors was my Audubon Chapter speech earlier in the year. Most of my blog posts were in preparation for that talk. Must have gotten confused thinking the work up of images for that presentation had already been posted here. 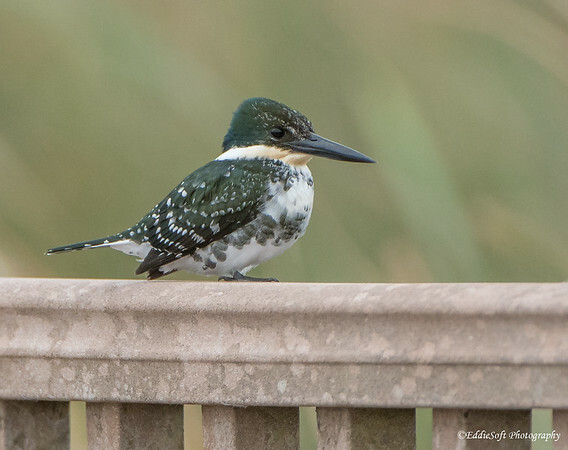 A quick search of the blog came up empty – long story short(er), this cool looking Green Kingfisher was inadvertently skipped. So glad this was found, this Kingfisher is one of my favorite finds from the trip to South Padre Island Bird Viewing and Nature Center. Truth is I almost missed getting this female in the tin. I was walking along the boardwalks at the center trying to take in the multitude of birds that hang out there. An Alligator had made its way to the reeds along the bank which, as you would expect, consumed my attention. Somehow this Kingfisher managed to fly in and perch on the railing behind me. After taking a few thousand shots of the Alligator (ha), I turned back around and my heart skipped a beat. “What is THAT?” Nothing like being visited by a neotropic bird that calls Central and South America home. According to the region maps, it looks like it does venture up into the southern tip of Texas. Another check on my bird list that Ron will need to travel in order to cover – yeah. Unfortunately, Miss Green didn’t stay around very long. Managed to get just a few shots before it took off … for good. She never came back the rest of that day nor was she spotted the following day – and I was definitely hoping to meet her again. Even ended up showing another birder that day the limited pictures that made it into the tin. 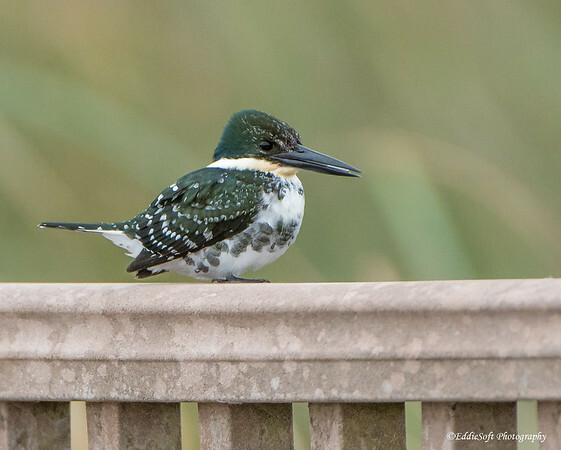 He was adamant that I was confused with the Belted Kingfisher that was hanging around the other end of the boardwalk – Nope, very familiar with the Belted and had that in the tin from earlier in the day. A few quick tidbits before I call it a night. I found it interesting that the male Green Kingfisher is identified by a rufous collar. The Belted Kingfisher is the opposite. In that species, the male is slate blue and white where the female has the rufous coloring (on the sides). Pretty sparse on the cool facts for this bird – about the only other tidbit is they nest in burrows on banks along water – usually only 2-3 inches long and less than a foot above the water. Unlike other Kingfisher species, the Green variety are smart enough to cover their entrances. Hope you enjoyed today’s featured bird. Definitely one of my favorite takeaways from the Texas Gulf Coast trip. I’ll try my best to be more productive the rest of the month. Great shot of a smart bird, great finding your own rarities. Thanks – certainly a thrill when I encounter a winged creature I’ve never seen (and honestly never heard of) before. I could tell it was in the Kingfisher family, but definitely one I had to race to the reference books to figure out the specific species thanks to not being listed as a true North American bird. Appreciate you stopping by and chiming in. Wow, what a cool bird! Emerald green and white. 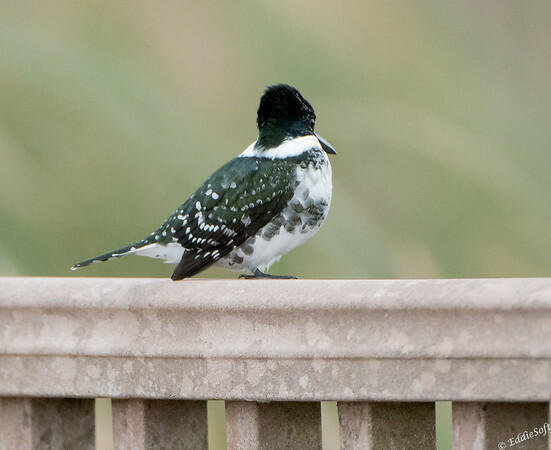 I don’t know how anyone could confuse this with a Belted Kingfisher. It looks a little top-heavy, like it’s going to fall forward with that huge bill. I saw mention on the Roger Tory Peterson Institute site that the bill can slice a researcher’s hands. Cool pictures of a cool bird, thanks! But I’ll be up all night now pondering the relationship between centric fissions in its macrochromosomes and its diploid number. No thanks for that. Thank you! You are right, if the colors didn’t give you a good enough distinction between the Belted, the bill certainly would. That thing is gigantic and can’t believe I didn’t even mention that in the post – likely some unconscious bias to overlook those species with large noses out of respect ha. Had no idea it could slice through your skin, must be extra strong/sharp to get through the crustaceans down there. I did notice an error in the karyotype math. Clearly they meant 2z = 42 and not 2n = 94 – that error was a new slapper. If you are going to waste time thinking about diploids, then I need to get you some haunted prop equations up there pronto – Halloween is fast approaching and my latest creation isn’t functioning like it should! You might need to roadtrip down there. Thankfully, it looks like you will not lose that much sleep ha. Thanks for stopping by and another wonderful comment. Thank you – one of those birds where the picture falls short of how stunning it looks in person.